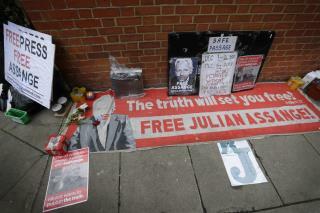 (Newser) – There are fresh signs that Julian Assange's extremely long stay in Ecuador's London embassy might be nearing its end. President Lenin Moreno told the Ecuadorean Radio Broadcasters' Association Tuesday that the WikiLeaks founder has "repeatedly violated" the terms of his asylum in the embassy, where he has been holed up since 2012, reports Reuters. The president complained that "photos of my bedroom, what I eat and how my wife and daughters and friends dance" had been shared online. He didn't accuse Assange himself of sharing the private photos, though his government has said it believes WikiLeaks is responsible for the leak, the Guardian reports. So now the "Jig is up" on the Russia/Wikileaks arrangement throughout the 2016 election, and Ecuador is getting nervous about housing a US enemy. So, the Russians have hacked info on Moreno to blackmail him with, to keep Assange holed up in the embassy under the threat of exposure. Hence the "history will not be kind" statement. Meanwhile i'm sure the US is exerting some pressure on them as they would like to ask Assange a few questions in a windowless room. More and more, I am reminded of the O Henry story: "The Ransom of Red Chief." The Ecuadorans gave Assange asylum, rather than kidnapping him, but in the end they're going to have to pay someone to take him off their hands. Message to Assange: "Don't bite the hand that feeds you."